Life is to be tasted each and every day – a long standing truth fully understood by those who know what life is really about. Life is to be tasted each and every day – a long standing truth fully understood by those who know what life is really about. Magic moments happen all the time and it’s only up to us how we make the most of them and whether we make them worth taking a trip down memory lane later. Extra experiences as well as extra tastes count equally. That’s exactly what we have in mind when introducing the brand new scotch Chivas Regal – Extra. It took Chivas Regal roughly ten years to come out with another specialty. The whole new Chivas Regal Extra is built on tradition established by James and John Chivas, the founders of the brand and visionaries in the world of whiskies. This fine beverage takes this luxury scotch to a whole new level. Master blender of Chivas Regal Colin Scott kept his nose to the grindstone to conceive a unique blend of complete and abounding taste to be enjoyed by everyone who craves to aim higher in life. 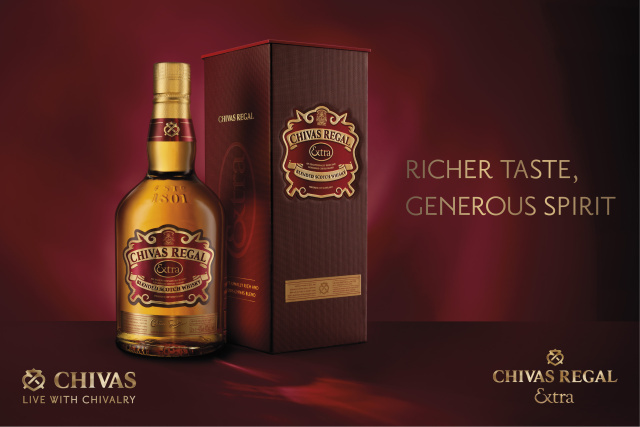 The remarkably rich and meticulously conceived Chivas Regal Extra is a blend of particularly special selection of the highest quality malt whisky having been aged in barrels that previously housed sherry from the Oloroso region in Spain. As a result an exceptional whisky of dark color with an ambery reflection in combination with an irresistible taste came to life. The fruity flavor is dominated by ripe pears, watermelon, caramel, milk chocolate and cinnamon with a soft hint of ginger. Just like the flavor, the taste borders on the sweet reminiscent mostly of ripe pears paired with a tropical climax of watermelon, vanilla, caramel and almonds. The finish is a traditional long touch. The quality of this delicate beverage was already appreciated last year in San Francisco when it was awarded the gold medal in the category of blended whiskies aged longer than 15 years. The first prize of the competition organized by the renowned magazine The Spirits Business in the category of The Scotch Whisky Masters 2015 went to Chivas Regal – Extra as well.